When I sink my teeth into a Beatriz Williams novel, I know that I’m in for a decadently delicious treat. I know that I’m going to meet a narrator dripping with effervescence and personality, that I’m going to be swept away to another era, and that I’m quite possibly going to fall head over heels for a one-of-a-kind literary hunk. 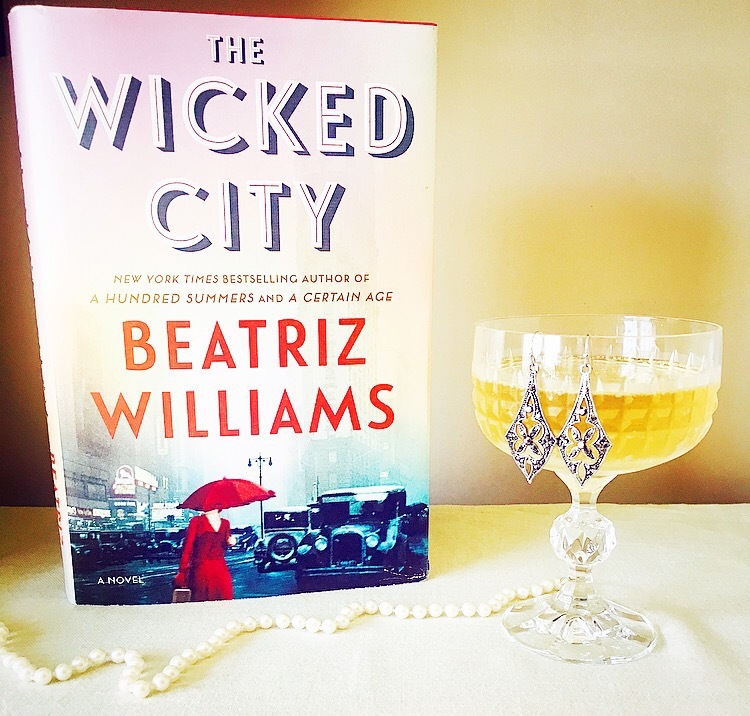 These are just a few of the reasons why Beatriz Williams is one of my very favorite authors, and a few of the reasons why I absolutely loved The Wicked City, the first in a new series set in the Prohibition age. The Wicked City introduces us to Gin Kelly, a country girl from rural Maryland turned fiery New York City flapper. A regular at a speakeasy known as the Christopher Club, Gin gets caught up in a raid and finds herself locking horns with steely (and hunky) Prohibition agent Oliver Anson. When Anson convinces her to work with the agency in order to catch her stepfather, Duke Kelly—a ruthless bootlegger with power that stretches far beyond Appalachia—Gin reluctantly renews her ties with the hometown and wicked man she ran from years ago and vowed never to see again. The juicy, edge-of-your-seat 1920s adventures of Gin and Anson are told in parallel to a narrative set in 1998, when Ella Gilbert, a reserved forensic accountant who likes to play it safe, moves into a charming, old apartment on Christopher Street—the same building where Gin housed her escapades seven decades earlier. Nursing a broken heart courtesy of her cheating husband, Ella attempts to start a new life for herself—if she can get past the mysterious noises and history harbored down below, in what was once the speakeasy next door. The Wicked City has it all: action, romance, intrigue, and history, and I loved it to the last drop. One of the things I enjoy most about Beatriz Williams’ novels is that they all take place in the same world, with characters from one novel showing up in another, their lives all somehow intertwined. Each novel stands on its own perfectly, but it’s always exceedingly fun to catch up with old favorites through cameos and watch as the family connections reveal themselves. A big part of this joy comes from the fact that all of Williams’ characters are vibrant, complicated, and unforgettable, and that’s certainly true of the new cast of characters introduced here. Gin Kelly follows in the tradition of the captivating and bold heroines Williams is known for, with a voice that leaps off of the page and enchants you at every turn. I can’t wait to spend more time with her in the next book in this series (The Wicked Redhead, due out next year). Both Gin’s and Ella’s stories surprised me and shot off into directions I didn’t see coming, making this another novel impossible to put down and impossible to forget. It is without a doubt one of my favorite books of 2017. If you love a mesmerizing story that transports you to another time and showers you with characters you’ll remember forever, I give Beatriz Williams and The Wicked City my highest recommendation. It’s all the fun of a speakeasy in the roaring 20s–without the risk of getting caught in one of those pesky Prohibition raids. For more on Beatriz Williams (fellow beagle mom) and her one-of-a-kind books, visit beatrizwilliams.com and connect with her on Facebook, Twitter, and Instagram. Her next novel, Cocoa Beach, hits shelves June 27th! Great review Stephanie. Sounds like a thriller you might not want to put down until you’ve finished it!